The Libelle Pen Company of New York is your final solution for a classic pen with great value. 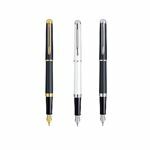 Their pens have deeply colored lacquer finishes, and impeccable presentations. Playful designs utilizing rare shapes and patterns carefully balanced with functional utility. Libelle New York, changing the ordinary to the extraordinary.